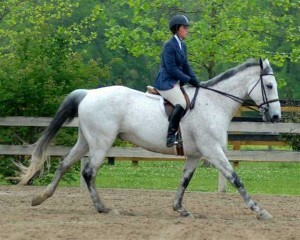 The rider's upper body is ahead of the motion and her lower leg has slipped back in the air. Secondly, you need to think about the way you use your upper body over a fence–that is, let the horse jump up to you so that you only close your upper body as necessary to be in balance over your leg in the air, rather than leaning forward at take-off in anticipation of the jump, which will encourage your leg to slip backward. You can practice controlling your upper body by jumping gymnastic exercises, making sure that you don’t close your upper body any more than is necessary for you to keep your balance in the air. In order to work on your upper body, approach the exercise in two-point position, so that the angulation of your upper body will keep you in balance above the angle of your lower leg. Don’t move your upper body forward as the horse nears the take-off spot to the first oxer, but allow the animal to jump up to you, so that its withers rise to close the space in front of you. 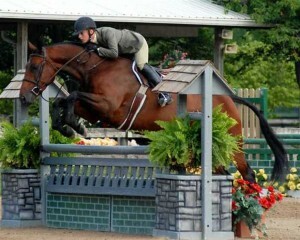 The rider's upper body is perfectly balanced over her lower leg as she looks at the upcoming fence on a tight turn. All you need to do is stay balanced over your own legs, for there is nothing you can do to aid your horse in jumping and much you can do to distract the attention and disturb the balance of the horse by moving your upper body forward in the air. By controlling the desire to throw your upper body forward at take-off, you’ll help yourself keep your leg in the proper position, adding more downward weight to the stirrup so that your lower leg won’t slide back so easily. 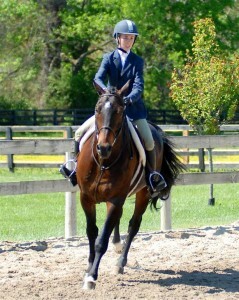 Several problems are created when a horse cuts the corners of the ring on course. First, the horse’s weight is distributed too heavily toward the inside of the turn, so that the animal is unbalanced on its approach to the upcoming line. Second, this habit is usually accompanied by the horse being bent in the wrong direction, so that its vision is jeopardized. Third, by cutting corners, the horse leaves the rider with fewer strides in which to make adjustments following and leading into the lines of fences. The horse is bent the wrong direction and leaning inward as it cuts the turn. The main thing to remember in solving this problem is to push the horse to the rail with an inside leg and an inside indirect rein, rather than pulling it to the rail with an outside hand. In practice sessions, wherever the horse starts to cut the turn, do a downward transition to the walk and push the horse toward the rail using the aids given above. 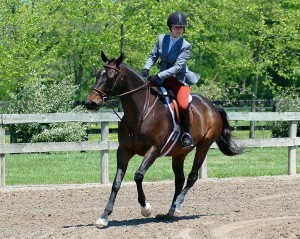 In competition, if the horse tries to cut the turn, shift your upper-body weight slightly toward the outside of the turn while using the aids given above. This will help adjust the vertical plane of the horse’s body back to center, making it more difficult for the horse to cut in. The horse is properly bent on the corner. Notice how the rider and horse are aligned on the same plane. There are three basic positions that a rider can use: two-point position, in which the rider’s two legs are against the horse, while the seat is out of the saddle; three-point position, in which the rider’s two legs and seat are in contact with the horse; and modified three-point position, in which the rider’s two legs and only his crotch are in contact with the horse. 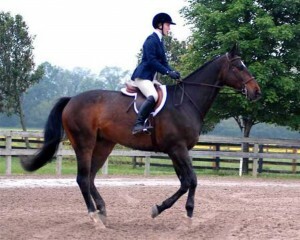 “Two-point position” is used during the hand-gallop and for riding hunter, equitation, and jumper courses, beginning in the initial circle and ending as the horse performs a downward transition at the end of the round. Two-Point Position---The rider's legs are on the sides of the horse, the seat is out of the saddle, and the upper body is inclined about 20 degrees in front of the vertical. 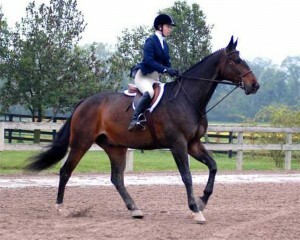 “Three-point position” is used at the walk, sitting trot, and canter, and on course only in extreme situations—such as when the rider needs the seat as a driving aid when a horse tries to refuse an obstacle, or when there is such an acute turn during a jumper course that the rider must fully sit in order to execute it. Three-Point Position---The rider's legs are on the sides of the horse, the rider's seat bones are on the saddle, and the upper body is inclined only 2 to 3 degrees in front of the vertical, which is the same position as for the walk and sitting trot. 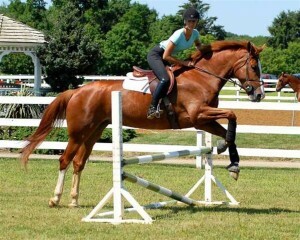 “Modified three-point position” is used occasionally during an equitation or jumper course, when the rider needs to drop his center of gravity and brace himself a little more at the thighs in order to execute a sharp turn or ride a distance set on short strides. Modified Three-Point Position---The rider's legs are on the sides of the horse, the crotch is lowered into the saddle, and the upper-body is at the same 20-degree inclination as in two-point position. A major error is the use of three-point position as the “status quo” during any type of course over fences. In hunter classes, three-point position is unnecessary and makes the performance look stiff, rather than flowing; in equitation classes it is theoretically wrong, since the proper use of two-point has been established to free the horse’s back of the rider’s weight and to put the rider in a stationary position that allows the horse to maintain its balance at take-off, in the air, and on landing; and in jumper competition, three-point position slows the speed of the horse, which can be a critical fault in classes in which time counts. The inappropriate use of three-point position indicates that the rider is using his seat to supplement an ineffective leg aid and/or the rider is lacking in knowledge of the basics of hunter seat riding.